On this Thanksgiving morning, let me reach out to wish you all a day filled with love, with blessings, with gratitude and with being surrounded by loved ones. Be more patient today. Be kinder today. Be loving today. Be grateful for all the goodness in your life – from the biggest to the smallest of blessings! Happy Blessed Thanksgiving to all! I like Mondays as it’s the start of the new week and there’s much optimism in a new week’s adventures. I know typically people feel like they are sludging through Monday mornings, but not me. Maybe it’s just my personality, but to me, it’s a new beginning, like the start of school in September! But this week can be particularly stressful since Thanksgiving is on Thursday. All of the last minute preparations for the big feast can wear on those who are hosting the event for family. Let’s face it, that all-encompassing dinner is a lot to prepare, even for the most seasoned cooks. Sometimes the stress of being with family is hard too. Lucky for me, I’m not hostessing this year, so I’m a bit more relaxed. For those of you who are, well, I’m sending you lots of strength, patience and a delicious meal and well-behaved guests! This week kicks off the holiday season with Thanksgiving, then Black Friday shopping and the Christmas season coming up. I find it to be invigorating myself, but maybe I’m an anomaly. How are you feeling? I hope you have a lovely week and that today brings a skip in your step and not the dragging of feet. Keep shining your heartlights and I’ll send you mine! Gratitude for the gifts I did not see coming. Gratitude for the connections made when I was broken. Gratitude for this perfect moment in time. Holidays are coming upon us! Are you feeling festive yet? Have you seen the decorations at the stores reminding us that Thanksgiving, Hanukkah and Christmas seasons are on the horizon? Have you put away all of your Halloween decorations and begun thinking about turkey, sweet potatoes, stuffing and pumpkin pie? 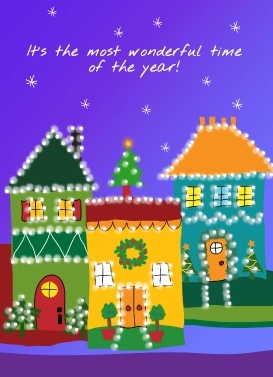 Are you making plans for the festivities? Ready to share your bountiful gratitude with your family and friends? I hope you answered a resounding YES! And if you didn’t, then let’s begin today, for gratitude begins with you. In the hustle and bustle of the holidays, it’s important to remind ourselves what the holidays are really about ~ sharing time, your presence with those whom you love ~ and reaching out those special family and friends who aren’t nearby. What better way to do that, to remind someone of how much you appreciate them, than with a card?! Imagine your friend or family smiling when they open a card from you amidst the bills and boring mail ~ what a lovely surprise to know you are thinking of them! The card above is one of my favorites from the collection for Thanksgiving. Who came to your mind when you saw this card? Want to send it without leaving your computer? It’s easy to do. Click below and enjoy a card on me ~ it’s easy to point, click and upload your photos, add some special decorations and mail your card all from your computer! Your recipient will get a paper card in the mail! Click here to try it today! Who’s waiting to hear from you? 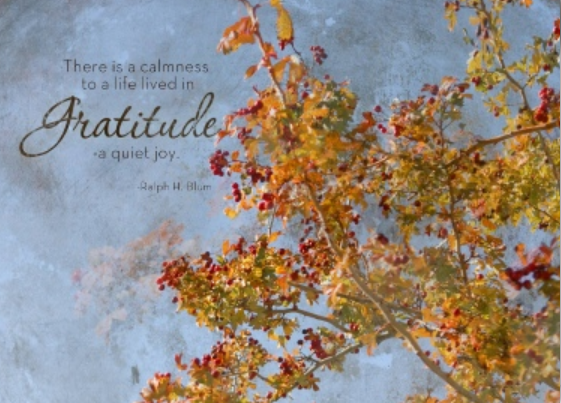 There is a calmness to a life lived in gratitude -a quiet joy. Thanksgiving is on its way and I want to share a little something I do that gives me great joy. I have been taking a few minutes to send a card of gratitude to those precious people in my life for whom I am grateful. Just a little note which says ‘I am thinking of you’ or ‘thank you for being you’ and sending it off with the touch of the SEND button. I don’t leave my comfy home nor get out of my pjs to do it. I simply log onto my computer, go to my site, pick a card or make one with my own photos or elements provided, write my message, click send and voila ~ I send real paper cards through the mail ~ I’ve even sent some delicious brownies and cookies among other fun finds. I know I sound like a commercial, but truly, I adore what I do. It makes me happy and it delivers happiness when I hear that a friend has received my unexpected card in the mail and is touched by the gesture. Who doesn’t like to find a treasure in the pile of junk mail and bills? To just know that someone is thinking of you is such a priceless gift. I, myself, have been the recipient of many unexpected cards in my life and I can attest to the power of kindness and the amazing accuracy of a well-timed card in helping to raise spirits when you are feeling down. And even when I wasn’t feeling down, just knowing that someone thought of me enough to write me a note and send it is priceless. It simply raises up our loving vibrations ~ for both the giver and the receiver! In gratitude for your loving energy and support, please feel free to enjoy a card on me. Just click here!